Background: There are many contradictions about pregnancy and fetal/neonatal outcomes after topical use of timolol alone or timolol in combination with other antiglaucoma medications. 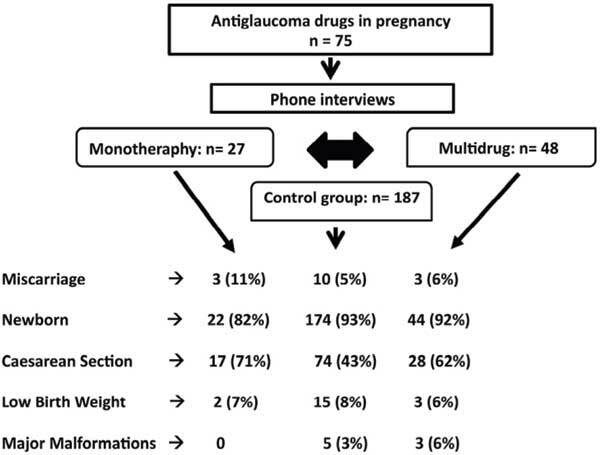 Methods: Seventy-five pregnant women exposed to antiglaucoma medications were followed prospectively by phone interviews. 27 women used timolol as monotherapy, 48 women used timolol as a part of multidrug therapy. We selected a control group of 187 healthy pregnant women. Results: Topical use of timolol alone or timolol in combination with other antiglaucoma medications does not influence pregnancy or fetal/neonatal outcomes. Conclusion: Beta-blocker is the first choice treatment for glaucoma in pregnancy but, when necessary, multidrug therapy should not to be excluded. Keywords: Congenital anomalies, drugs, glaucoma, pregnancy, prenatal diagnosis, Teratology Information Service (TIS). Keywords:Congenital anomalies, drugs, glaucoma, pregnancy, prenatal diagnosis, Teratology Information Service (TIS). Abstract:Background: There are many contradictions about pregnancy and fetal/neonatal outcomes after topical use of timolol alone or timolol in combination with other antiglaucoma medications.